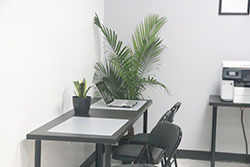 24/7 access to a private office of your very own. Not only that, but you get the opportunity to collaborate easily with business owners, giving you the best parts of working in a community while still having space to do your own thing. Work in the most effective way for your business. With a private office, you get a chair, trash can, and lockable filing cabinet. You also have access to printing, mail, package services, training, master-classes and guaranteed* qualified leads to help you build your business. To find out more about serviced offices or to schedule a tour call, visit or click the button below for step-by-step instructions.